 The 2016 Access to Seeds Index found only three companies that currently engage in partnerships with gene banks in Eastern Africa. The 2016 Index found only three companies – East African Seed, Kenya Seed Company and Seed Co. – that currently engage in partnerships with gene banks in Eastern Africa. They focus on multiplying and/or characterizing and evaluating germplasm that may be suitable for smallholder farmers in Index countries. Kenya Seed Company, for example, which ranks fourth on the 2016 Regional Index for Eastern Africa, collaborates with national seed banks at the Genetic Resources Research Institute in Kenya. It also works with international research institutes CIMMYT and ICRISAT to characterize and evaluate the germplasm of maize, sorghum and finger millet. For maize, the traits include tolerance to abiotic stress, such as drought, or resistance to pests and diseases, such as streak virus. For sorghum, the company also focuses on nutritional traits. In total, 920 accessions of maize have been tested and assessed, as well as 100 of both sorghum and finger millet. Clear opportunities exist to scale up partnerships between seed companies and gene banks or local research institutes. This could be by increasing gene bank support to include vegetable crops, which are not currently represented in any existing partnerships, or by expanding to other Index countries or regions. Support could also take other forms, such as in-kind donations, financial contributions and technical assistance with multiplication of germplasm that could be relevant for smallholder farmers in Index countries.